On August 4, 1914 Britain declared war on Germany, pulling Canada into what became known as the Great War. 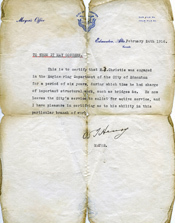 Driven by a sense of duty and longing for adventure, many men in Edmonton enlisted to fight what they thought would be a short war. Little did they know the conflict would last four years and claim millions of lives. 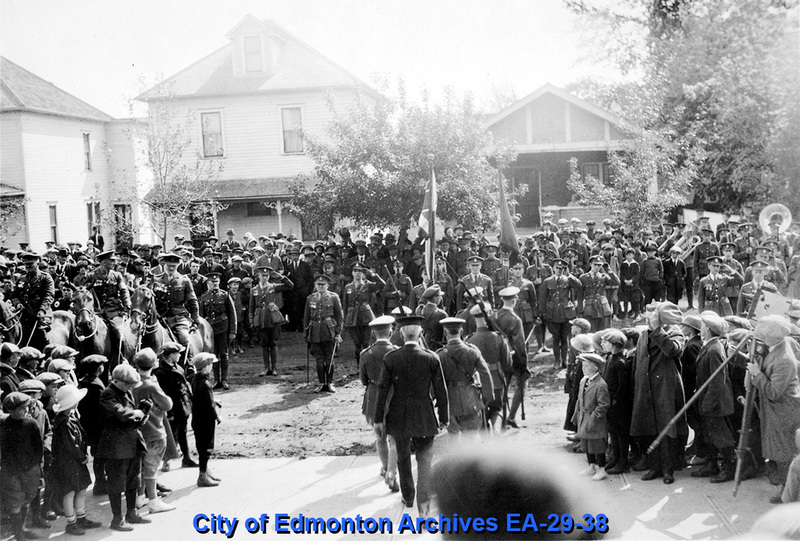 Around 14,000 men enlisted in Edmonton to serve overseas. Thousands were killed in action or died of wounds sustained in battle. Government regulations increased in many areas during the war. As the conflict continued, inflation and home front shortages took their toll on Edmonton’s workers and families. Many on fixed incomes – not just older people, but the wives of soldiers – found it very difficult to make do. Eventually the government introduced rationing to ensure that the scarce resources were shared more equitably. 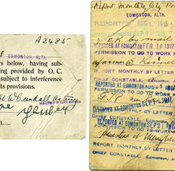 Censorship, restrictions on movement (like curfews) and alcohol consumption, and income taxes were also put in place across Canada during the First World War. Adherence to those interventions were secured by the use of propaganda and exploiting of patriotic fervour. City employees who enlisted were able initially to request a leave of absence from their positions and still receive half of their pay, which was sent to their wives. Unfortunately, as the war dragged on, the City found this was unsustainable. Later in the war, the spouses of former City workers could apply for assistance in cases of hardship which would be considered by the Councillors and the Finance Committee to see if relief could be arranged. 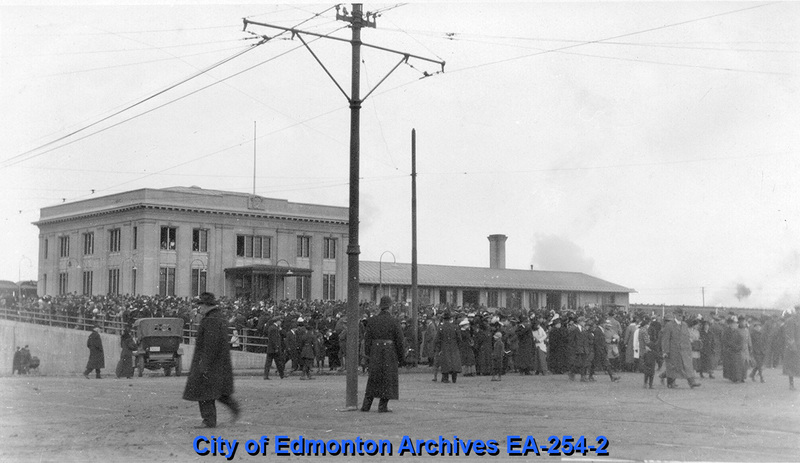 Edmonton’s City Council frequently received and granted requests to support charities which were contributing to the war effort. 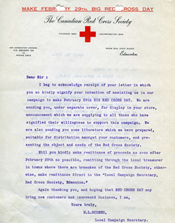 City Councillors tried to help those who were helping the war efforts through initiatives like free space for training and transportation on the streetcars for soldiers awaiting deployment, to grants to cover the utilities and light bills for the Red Cross, the Imperial Order Daughters of the Empire and the Cadet Corps. Fundraising efforts – like Victory Bonds, Red Cross tag days, the Canadian Patriotic Fund, and other smaller efforts were used to fund the national war machine as well as more local and personal projects such as providing picnics for the children of servicemen or assisting families to stay in their homes without a breadwinner. Canada’s strong support of Great Britain and its allies had a darker side. 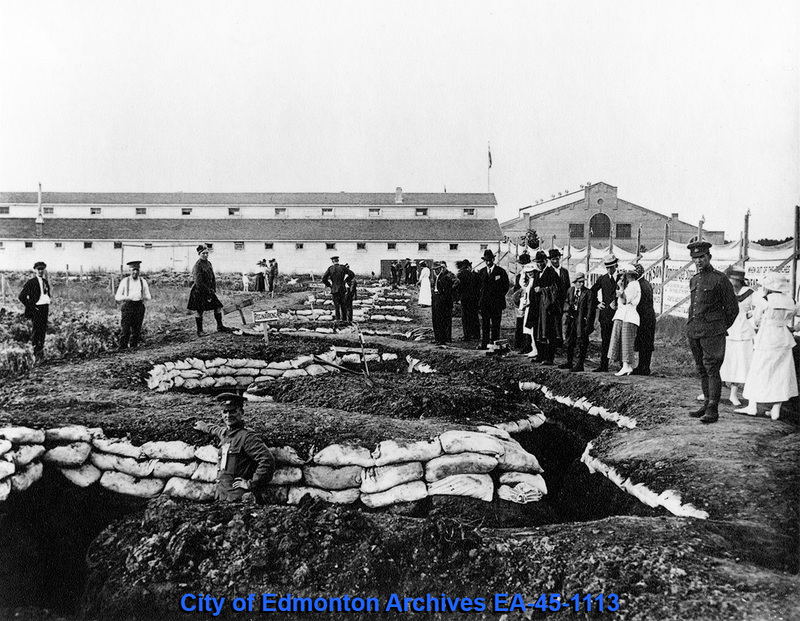 Many male immigrants from Germany, the Austro-Hungarian Empire and Russia (who were often Ukrainians) and other supposed ‘enemy aliens’ living in and around Edmonton were imprisoned throughout the war in Alberta’s four internment camps. The prisoners endured forced labor, harsh conditions, and widespread disease. When they were allowed to return home they found that their family often had experienced similar privations and often lost property or livelihoods. Many immigrants, not able to serve in the military because their countries of origin made them a security risk or at least less desirable as soldiers or sailors, were able to take factory jobs in the industrial sectors or work in the cities in labouring functions.